A meeting where blockchain developers can voice their opinions was prepared and it gathered voices from top developers that establish groundwork for blockchain industry. 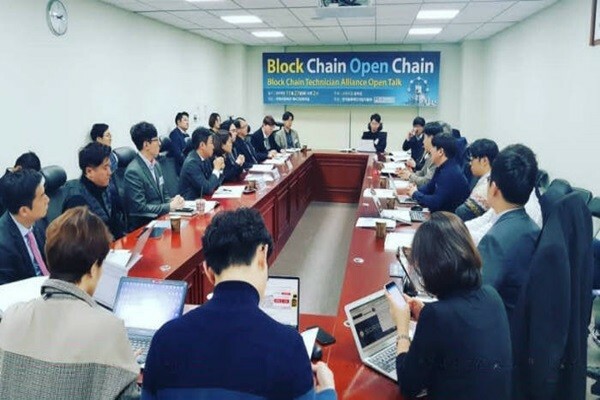 Song Hee-kyung, who is a member of Liberty Korea Party, held ‘Block Chain Open Chain: Blockchain Technician Alliance Open Talk’ at The National Assembly Hall on the 27th with Korea Blockchain Developer Association (Chairman Jung Han-shin) and held a first meeting with blockchain engineers (developers) at the center. About 30 people such as blockchain developers from top blockchain businesses, CEOs of blockchain startups, lawyers, and financial investors were in attendance and they freely discussed about various topics. Participants pointed out that investments and new businesses can be propelled once uncertainty is resolved. Participants also criticized South Korean Government for promoting blockchain while prohibiting cryptocurrency and ICO. Participants also shared doubts about South Korean Government’s blockchain projects. They are criticizing that there is not enough competitive edge with commercialization as its blockchain projects are inertially awarded as SI (System Integration) demonstration projects.